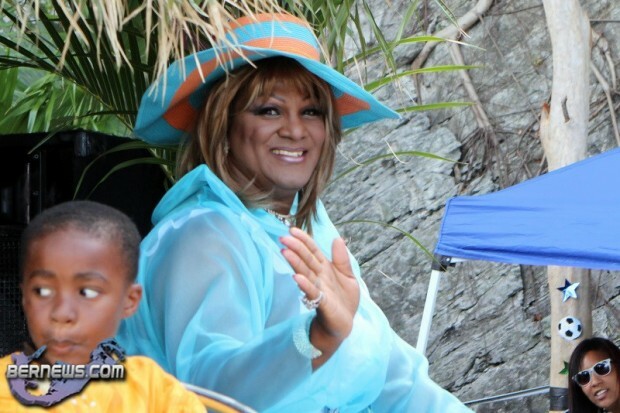 Mark Anderson – aka Sybil Barrington – will join a group of fellow Bermudians in marching in the London Pride Parade on July 2nd. The Parade seeks to raise awareness of discrimination and difficulties affecting the lives of lesbian, gay, bisexual and transgender [LGBT] people around the world, and expects to attract approximately a million people. Last year pink Bermuda shorts, scooters and the Bermuda flag could be seen on display as a group of Bermudians and their supporters marched in London’s Pride parade in July 2010 to protest against the Island’s failure to outlaw discrimination on the basis of sexual orientation. 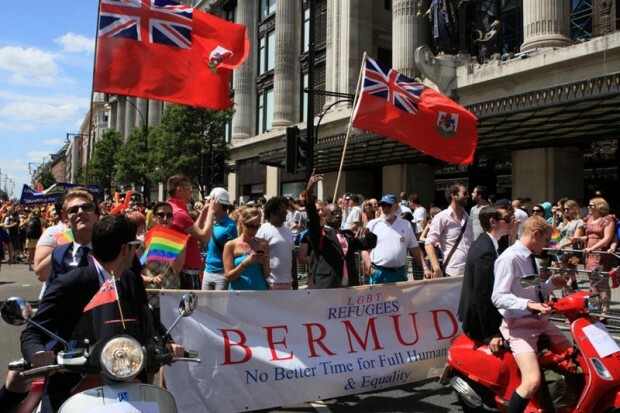 Around 20 people, marched behind scooters with a banner which read “Bermuda” and “LGBT refugees: No better time for full human rights and equality” through London’s West End. The Pride London Parade, now in its 40th year, is one of the largest of its kind in the world, with an estimated attendance of a million people. This will be the third consecutive year Bermudians have particated in a group. Posted by ………..This week Bermuda is the 56th anniversary of the with a host of events including talks music and poetry readings…The celebrations are to include a ceremony on the steps of City Hall on Friday at which Premier Alex Scott will read the Human Rights Proclamation…Unfortunately unless the Premier also takes the opportunity to commit his Government to outlawing discrimination on the grounds of sexual orientation theres going to be more than a whiff of hypocrisy about the whole thing…………..Posted on 06.12.04 at 08 00……… ………Bermudas human rights record for sexual discrimination places it right up there with many 3rd world countries.Its the main reason I dont recommend Bermuda to my friends its embarrassing..Its time to stop the discrimination Bermuda………..Posted by ….Steve on….06.12.04 at 09 57……. The sign of the rainbow has been used traditionally as a sign of “diversity and inclusiveness, hope and yearning” – something we should all aspire to. Wishing all the best to Sybil and all other Bermudian pariticipants. I plan to join you all one day. @ Business Daily thank you for post from 2004, yes it is a real tragedy that the thinking of many of our citizens puts us in with that of third world countries. But we must live in hope that change is/will come. Gay equality is more than just a matter of fairness — it’s also good for the economy. In 2008, the estimated 15.3 million gay adults in the United States had a combined buying power of more than $660 billion, and it’s estimated to grow to $835 billion this year, 2011, according to Witeck-Combs. Clearly this is an economic “opportunity” for Bermuda tourism…to get a piece of the pie. this is ridiculous!! Keep gay marriage illegal !!!! PLEASE !!!!! Wow jump the gun much? Who is talking about gay marriage? The amendment is only seeking basic human rights for all, that is, the right to pursue employment, shelter and basic services, without discrimination. All human beings should have those rights. It is not an endorsement of any particular lifestyle, and it is long overdue! I surely will be on the sidelines cheering on friends…This should be another Big turnout as it was last time. Oh such fun! Thanks for enlightening those of us who didn’t know . @SuckerPuncherExPat – please explain why you feel this way. How would this decison affect you as an individual? We all should care. As long as any one of us is at risk of discrimination, all of us are diminished. I’m not discrminating. I love him and he could do what he likes, it just doesn’t have to be made public. Just like you didn’t have to click the link, read it, then comment. You obviously did care enough to do all of that. It actually DOES have to be made public. Until there is true equality among ALL of us, these things need to be brought up whenever possible, lest we forget that there IS inequality. @ Anyone – what a contradiction. If you love him and support him in that he can do whatever he likes, what difference does it make? Okay over-reactors, I’m not interested in what you do on your vacstion either, but please feel free to make it public.